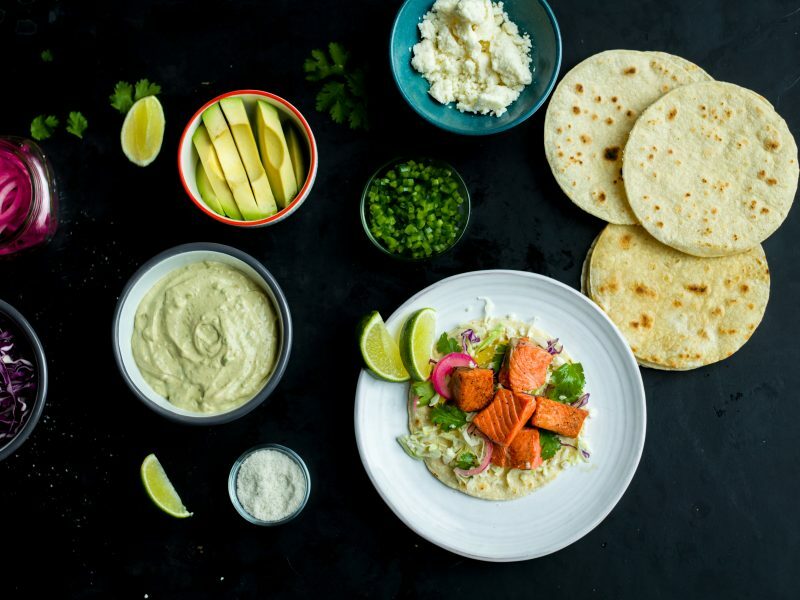 From a practical standpoint, wild salmon is so versatile and easy to prepare that you can incorporate it into literally every part of your meal plan, and that includes your appetizers. Don’t be afraid of salmon skin; it contains a lot of essential nutrients such as omega-3 fatty acids, plus vitamins B and D. The salmon tartare here is refreshing and light and perfectly seasoned with shallots and citrus juices. If your goal is to impress your guests, this dish needs to be in your appetizer repertoire. Carb-free apps never tasted so good. Typically we gravitate towards anything that is served on a cracker, but these poached salmon bites sing a different tune. The cucumber and dill pair perfectly with the light and flaky salmon spread. If you’re a fan of smoked salmon for brunch, these summer rolls are for you. They’re salty and refreshing and light with every delicious bite. And we promise they’re actually easy to achieve at home. These salmon bites look like they came from a professional kitchen, and all you really need is a little bit of fire. Serve it on top of cucumber slices with a dollop of spicy wasabi mayo and people will think you ordered the best Japanese takeout in town. It’s hard to play favorites with croquettes, but these are pretty spectacular. They use minimal breading and lots of salmon. Plus you can make them in bulk and freeze them to use at a later date. A nice trick when it comes to making salmon tartare is that if you freeze the fish for a brief amount of time (20 minutes or so) it will be easier to dice into small bite-sized pieces, perfect for tartare. The sesame seeds and cucumber add a nice amount of crunch and the jalapeño adds just enough heat. Pro-tip: serve the tartare with potato chips or Terra chips. Stuffed mushrooms = good. Salmon stuffed mushrooms = amazing. It’s everything you love about stuffed mushrooms plus extra credit. Pâté is a paste made from meat, typically liver, that is served with crackers or some other carb of choice. But this salmon and leek pâté puts a slightly different spin on the traditional dish. And the best part is you literally dump all of the ingredients into a food processor and blend until you achieve a smooth, spreadable consistency. If you’re looking for a comforting appetizer, this salmon curry is warming, satisfying, flavorful and great to serve as a first course. It also makes a lot, or you can always double the recipe so that everyone will get a taste, which is great, because you’ll definitely want seconds. * Officially, we cannot recommend that you eat our salmon raw; and are required to inform you that consuming raw or undercooked seafood and shellfish may increase your risk of foodborne illness. There's a physiological change that wild salmon experience when they move from fresh water to salt water (and back again), which makes them more susceptible to parasites found in fresh water. While we follow modern flash-freezing processes that help to kill off the parasites, we definitely recommend cooking our salmon before eating it. Here's an article with a few more details on our thoughts behind this.